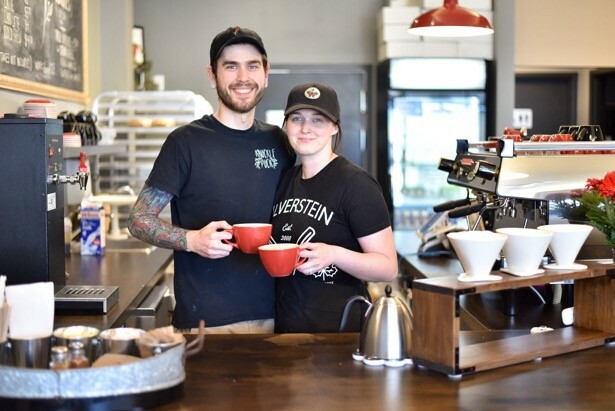 Conestoga Hospitality Management graduate Megan Dron and her husband Larry opened Red Eye Cafe and Donuts just seven months ago and have already been recognized with a number of first-place wins in the Cambridge Times Readers’ Choice Awards. Named best new business, best local bakery, best local café and friendliest staff, the business owners never expected to gain so much community support this quickly. The Cambridge Times awards were announced this past November and also included a second-place win for best cup of coffee. Waterloo Region Record readers have also named the café the best spot to get a doughnut. News of the café spread quickly on social media though thanks to a customer who dropped in on June 14, opening day, and shared word of Red Eye’s opening on Facebook. Two days later, the café’s first Saturday in business, customers were stretched out the door. “We had no idea we’d have to prepare for that many people, but it was a good problem to have,” said Megan, adding their initial goal in the first few months was to just get their name out in the community. The pair, both from Cambridge, had always planned on opening a café, but adding doughnuts to the menu wasn’t part of the mix until they secured their location at 600 Hespeler Road and realized there was a market for them in the area. They ended up with a winning combination that appealed to local customers: freshly brewed hot and cold drinks and a selection of gourmet doughnuts baked fresh on site every day that include gluten-free and vegan options, all served in a friendly, accessible environment. There are usually 15 types of doughnuts available daily and most flavours change monthly, but customer favourites like boston cream, cookies ‘n cream and apple fritters are always on the menu. Customer interest in Red Eye hasn’t slowed down since that opening weekend and thanks to its overwhelming popularity, the café has already outgrown its location. Megan graduated from Conestoga in 2016 and said her college courses in cost control and physical resources have been helpful in launching and managing Red Eye. She also looks back fondly on instructors that left an impression on her. Megan and Larry haven’t had time to celebrate their success yet, but are already looking at opportunities for the future. Expanding the menu to include soups and croissants might be a possibility, as is opening a second location. For now, as they look back on the last few months, they are happy to lend advice to other entrepreneurs: expect to put all your time into the business; be prepared to grow quickly; use social media; instead of trying to do a lot at once, just do a few things really well; deliver exceptional customer service; and create a good environment for your employees. Red Eye Cafe and Donuts is open Tuesday to Sunday. Visit its website for hours and more information. Conestoga’s Hospitality and Tourism Management (optional co-op) diploma program provides students with an overview of the hospitality and tourism industry along with entry-level management skills. Students receive a broad base of business and entrepreneur skills ensuring a strong understanding of financial, customer service, marketing, and the human resources aspects of the industry.